So begins Robert Fagles’ elegant translation of Homer’s Iliad, the 3,000-year-old account of the Trojan War, and from that day to this, humankind has sought in vain to understand the tragedy and futility of war. Few armed conflicts seem more futile in retrospect or more difficult to understand now than the Vietnam War. It took Ken Burns 18 hours to attempt to explain it in his recent 10-part documentary, though it’s well worth watching. Even if you’re interested in military history it can be a difficult thing to wrap your mind around, as the names and geography are unfamiliar and the fighting unconventional. Behind it all lurks the geo-politics of the Cold War and the turmoil of 1960s America, which is why many written accounts of the era are doorstops as well: check out David Halberstam’s The Best and the Brightest (1972) and Stanley Karnow’s Vietnam: A History (1983). Few wars ever had a better scribe than Neil Sheehan. His account of America’s “great clash of arms” in southeast Asia that killed more than 58,000 Americans and several million Vietnamese is epic indeed. 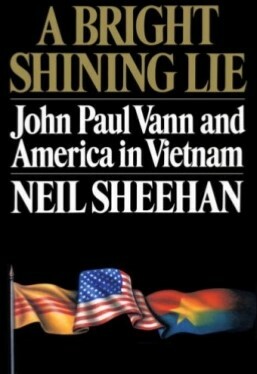 Sheehan was awarded the 1988 National Book Award for Nonfiction and the 1989 Pulitzer Prize for General Non-Fiction for his achievement. In order to explain the gargantuan struggle, Sheehan focused on the conflict through the eyes of one man, John Paul Vann, himself a tragic figure. Vann was a lieutenant colonel in the U.S. Army voluntarily sent to Vietnam as an advisor in 1962. He became convinced early on that America’s strategy of a big war fought in the style of World War II, with a focus on body counts and bombing runs, would never work against such a dedicated foe as the North Vietnamese. Every attempt Vann made to send back a true account of the war met official censorship from higher-ups who denigrated all negative reports as bad for homefront morale that would stymie the brass’s call for ever larger numbers of American troops. By 1967 Vann was advising his superiors that the war as fought would never be won, but no one in authority—from General William Westmoreland to Defense Secretary Robert McNamara to LBJ himself—wanted to be accused of “cutting and running.” If we didn’t stop the Commies in Saigon, President Johnson warned, we’d have to fight them on the beaches of Hawaii and then California. So the war went on and on, with the draft and social unrest, more Americans fighting in a place many couldn’t find on a map, more bombing, more atrocities, more civilian casualties, more POWs, and little sense of what victory would ultimately mean against a foe that would not surrender. The imaginative military thinking that had defeated the Nazis and Japanese in three and a half years had become complacent and arrogant, unwilling to believe that such a crude people in an underdeveloped country could resist the greatest military power on earth. The most interesting part of the narrative is John Paul Vann himself, a man driven to succeed at the highest levels while haunted by personal demons that would have crippled lesser men. He died in a helicopter crash in 1972 and was buried at Arlington, his sacrifice and those of thousands of his comrades seemingly in vain. In three thousand years, has very much changed? This entry was posted in Books, Culture, People, Places, War on July 22, 2018 by Stan Deaton.